Kitchen tables get hammered over time. Whether you have little kids digging in their forks into the table, or just host many dinners with platters scraping the top, the table gets abused. 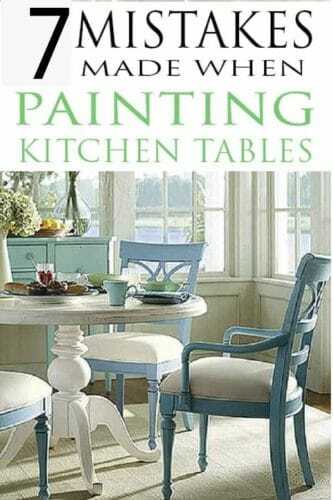 Eventually, most DIYers think of repainting their kitchen table. It is cheaper than purchasing a new table, and the best part: you get to make it exactly how you want it! 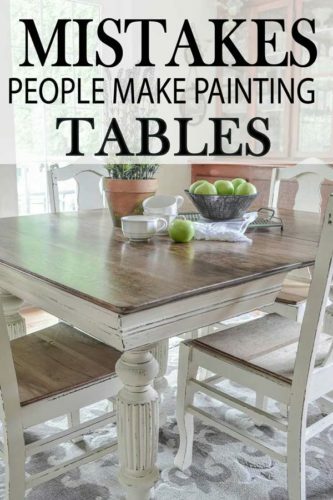 Painting a kitchen or dining table isn’t much more difficult than painting any other piece of furniture, but if you don’t know what you are doing, it can turn into a big mess. 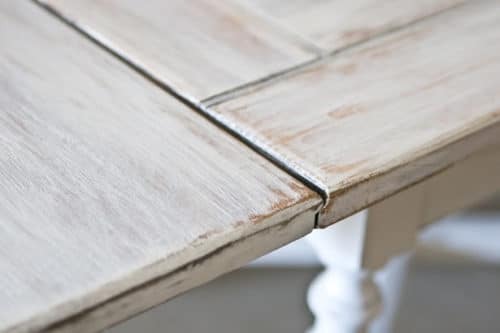 Before you begin your table makeover, remember the main concern of repainting a table is to make it durable. 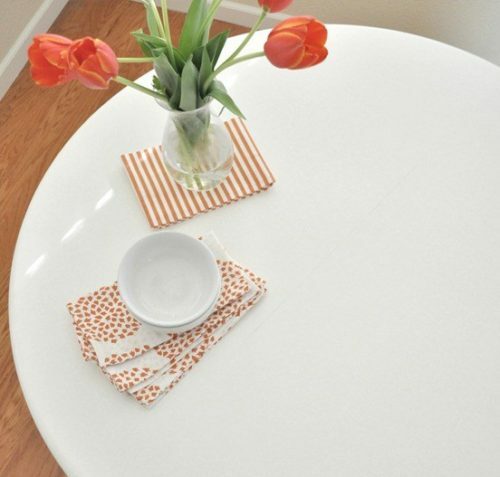 Kitchen tables take more wear and tear than your average dresser or bookshelf. And who wants to spend hours of work, to see chipped paint a week later? You don’t need to sand off all of the stain, however you do need your new paint to adhere to a rough surface. Sand enough until you have a rough surface and can see no glossy finish. When I sand a table, I use this Black and Decker sander. Not only does it take a 4 hour job and turn it into a 30 minute job, this sander has a pointed side to get into the grooves of legs and edges. I love mine and for less that $30 consider it a must for any DIYer. 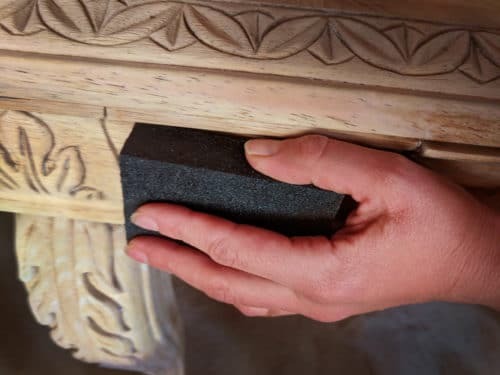 If you don’t take time to get everything sanded, including those beautiful table legs, you will end up with: paint peeling off, uneven surfaced, and possibly stain yellowing your new paint. Start sanding with a 80+ grit sandpaper, then move to 120-180 grit. You table will feel smooth enough at this point, but it isn’t. The legs are probably fine at this point, but the surface where your elbow and hands will rub, you need it even softer. Sand it at least one more time with 200+ grit. You will be in love with the feel of this table top after that 200 grit. It makes a world of difference! If you are staining your table top, do one more layer of 250-300. Before you apply your paint that you must have at least one coat primer or shellac based primer. 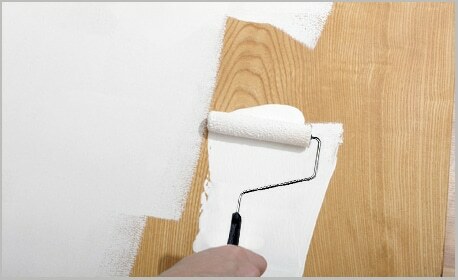 Shellac is used when you are covering a stained wood with paint. It helps keep the stain in and prevents future yellowing. Primer is used when the wood is bare. Make sure you use water-based primer for latex, and oil-based primer for oil-based paint or oil-based stain. On trick I use to cut my time in half is to use spraying primer, instead of brushing it on. Some hardware stores sell these, while others don’t. You can buy the spray Cover Stain primer here. This spray cost about $5, give you a softer finish than brush strokes and take half the time to apply the primer then a regular brush…your welcome! Let the primer dry for about one hour before applying your first coat of paint. Note: You don’t need a primer if you are painting with chalk paint. Keep the brush just for decorative legs please. A paint sprayer will give you the most even coat possible. It also gives you thinner coats which helps your table be more durable. I am NOT suggesting you use spray paint out of a can. A paint sprayer uses paint from a can. If you don’t want to invest in one (they cost about $40), than use a roller. Rollers can cover more surface than a brush, with fewer stroke lines. Pick a roller with a smooth texture, no one wants an orange peel table top. Which leads me to the next big mistake. Flotrol is a must if you are painting your table with latex. If you are staining it, skip this one. Floewtrol is a paint conditioner that helps reduce and in many cases eliminate brush strokes or lines. Floetrol also extends the drying time on each layer- which you may think is a negative- it isn’t. A slow drying time means a smoother finish and a harder finishing product. Tip: Never try to heat up your work area to quicken the drying time, let it happen naturally. If you are going to be painting with a water based paint, I would do at least 3, maybe even 4 coats of paint to the top of the table. With a dresser, 2 coats is enough, but with a kitchen table, you’ll need that extra protection and durability. Remember those coats should not be thick. Thick paint tends to chip more than multiple thin layers. Take your time to get your table done right. I love using my paint sprayer, instead of a brush because of its ability to distribute thin coats easily. I am constantly needing to pull out the magic eraser on my painted table to scrub off stains from food, crayons, etc. The magic eraser works great but it pulls a little bit of paint off every time. Make sure you have done 4-5 coats of clear coat on your table. This is where you really will make your hard work last. You need to do at least 3 or more coats of a clear coat. I prefer Polycrylic Protective Finish or this Fast Drying Polyurethane Clear Gloss . Sand it down with a 250 grit sandpaper with each layer to maintain the smooth finish. 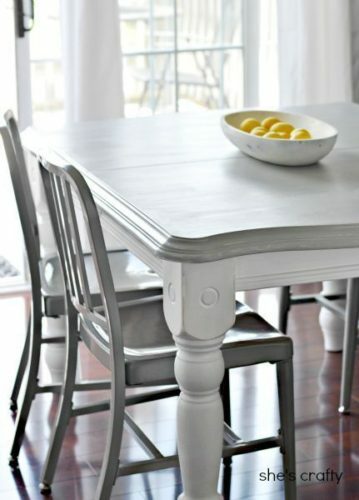 For tips on whitewashing your table for this look check out this article: How to Whitewash Furniture Wood. My sister had her kitchen table and chairs painted by a professional, but even they made this horrible mistake. The furniture felt dry to the touch so we all sat round admiring the beautiful table and enjoyed a great meal. After dinner, we all stood up and saw that the table now had rings where all the plates sat. The chairs were now textured with the pattern of everyones pants. Bumpy jean texture on new chairs is not what my sister had in mind. Follow the instructions on your paint can and allow the furniture to completely cure. This usually takes 5-8 days! This mistake is often over looked. 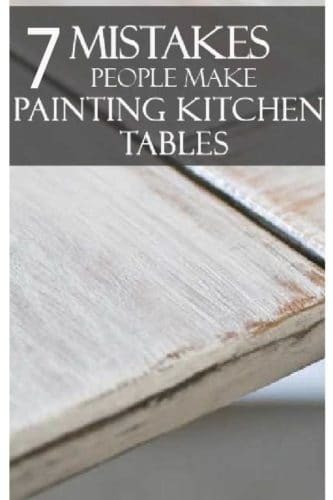 And as oil-based don’t make mistake #8 of repainting a table during a season where temperatures are below 50 degrees, not only do you need the temperature to help cure the paint, but you need to be able to open up the doors and let out the smell of these paints. Need some inspirations? 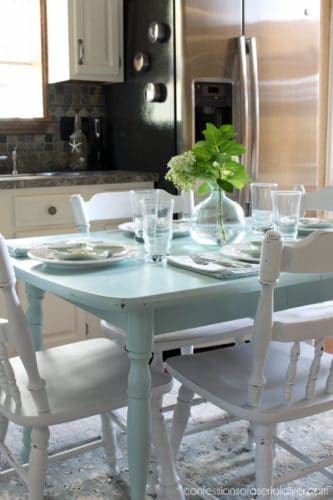 Check out these beautiful makeovers: Top 10 Kitchen Table Transformations. If you have any questions please comment below, I love to hear from my readers!